The stereotype that older people shun technology isn't always true. I got a healthy does of that this past week. Let me explain. This past week, I took some time away from work to travel to southeast Georgia to visit my daughter, son-in-law, and grandson before they traveled back to the Boston area, where my son-in-law is attending business school. And, while I was there this past week, I learned a little about myself and my fascination with technology ... through someone else, someone a little older. My daughter wanted to spend some time with her grandmother. Now, my mother got a Kindle Fire tablet -- the bigger one -- at Christmas. Not for Christmas, but at Christmas. She got it for herself. And, since she's been an Amazon Prime member for some time -- she saves a shipload of money on shipping because of how much she buys via Amazon -- she was happy when she discovered she could also watch movies and TV on her tablet, since Amazon Prime includes a decent library of video content. She asked me this past week if it was possible to get Amazon Prime content from her Kindle Fire to her big screen TV. "Not exactly," I told her, "but you can get Amazon Prime content to your TV by using something like a Roku box. 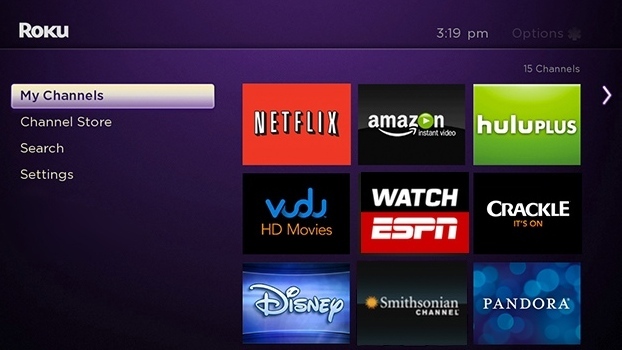 Just like your Kindle Fire can play Amazon video content, a Roku box can play Amazon content on your TV." "The same stuff? Same movies and everything?" "Yes, the same stuff. It's all from the same content library." "If I get a Roku, will you help me hook it up?" Next day, I hooked up her Roku (it's easy). I helped her create her Roku.com account (again, easy). Gave her the remote and showed her how to browse the Amazon Instant Video channel (app) on the Roku box. I pointed out how to tell what content was Prime (the little Prime triangle at the top left of the content thumbnail) and what you had to buy or rent to watch (no triangle). So, she sat down and started finding Amazon Prime content she wanted to watch and added those titles to her Watchlist. Around two dozen. She also bought some movies she liked. Next day, she wanted to know if there was a way to get her DVDs where she could watch them through the Roku. Seems she has several movies on DVD that aren't available through Amazon Instant Video, Prime or not. So, I told her about the VUDU Disc to Digital service. And she pulled out boxes of DVDs and, in about 30 minutes, found 14 that qualified for conversion. And, of course, added the VUDU channel/app to her Roku. She authorized her WatchESPN app against her Comcast XFINITY account, so now, when college football starts up again, she can watch all the games that ESPN carries. She set up a Pandora account and added that app to the Roku so she can listen to her Statler Brothers. She added a classic western movie channel/app so she has her Roy Rogers any time she wants. And, though the Roku she got doesn't support YouTube, she has Dailymotion installed. So, to summarize, a 78-year-old woman in southeast Georgia is sitting in her recliner, streaming movies, music, and other online content using technology and devices that didn't exist when she younger. Like, when she was 70. My sisters don't know quite what to make of it. They're not too sure about all that streaming of stuff off the Internets and what not using all those fancy devices and such. They're content to watch what the cable tells them, to post pictures of cats on the Facebook, and to run kids off their lawns. Their mother? She'll just let the dog deal with the kids on the lawn. She's busy watching stuff she likes on her big color TV. We dumped cable/satellite a long time ago. I get most of my news online. Our internet is provided by cable so we get the local channels through the TV. We then use a Roku to watch Amazon Prime, Netflix and there are a lot of free channels that have content that we watch or listen to music. We also have a ton of DVDs (I need to check out the VUDU thing because I have a bunch of codes) and recently we got a PS3 so now I can start getting Blu-Ray DVD. The only drawback is that I have to wait until the next season of Walking Dead to watch the previous season when they release it on Netflix and I am still waiting for Amazon to get the second have of Series 7 of Doctor Who and Day of the Doctor, but if i get real desperate there is always the Internet I can find it on. So yeah basically paying for bundled cable makes you a chump. Old ladies spending all their time steaming movies, tv, & music - kitties hardest hit. i think she can do better than the watchespn app and comcast account. you can get pretty much any sport that is broadcast for free at several online sites. i use mainly Feed2all.eu and Firstrowsports.eu they can be a bit of a hassle until you learn your way around. i have heard that if you download any of the apps, you could regret it, but you don't need to download anything. i haven't yet figured out how to get it from my computer screen to my tv, but i assume that you will know how to do that.